Organization and Corporate Logos – We can provide corporate or organization logos on the dials and headers of our post clocks. Rotary International – Electric Time Company is licensed to apply the Rotary International logo to your clock. 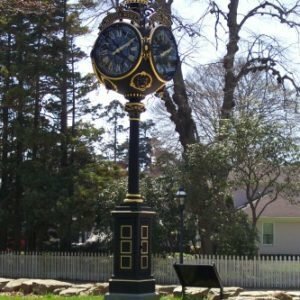 View our gallery of Rotary street clock installations. Protective Bollards – Protect your post clock from possible vehicular damage and complement the surrounding area with cast iron or cast aluminum bollards. The bollards can be connected by chains in locations with heavy pedestrian traffic. Black on White Dials – Special Acrylic dials are available for our post clocks that appear black during the day, but at night when backlighted they glow white. Typically the dial markings and hands are gold or gold leaf. This option is ideal for clocks with a black finish. 3K Gold Leaf Highlighting – Nothing is more striking to the eye than real gold on a clock. Electric Time will highlight your clock with real 23K gold leaf. Dedication & Donor Plaques – Cast Bronze Dedication and Donor plaques are available. Plaques are typically attached to the Post Clocks’ doors – or can be mounted on a nearby stone, granite block or wall.